Swiss painter, draughtsman and printmaker. He studied under Franois Diday in Geneva and then travelled to Paris (1837), to the Netherlands and Dsseldorf (1838), to Italy (1844) and to London (1850). Despite his frail health he spent each summer painting in the mountains of the Bernese Oberland and central Switzerland, where he produced the drawings and studies from nature that were later used in his studio compositions. A fervent Calvinist, he saw his subjects - the grandiose forces of nature, stormy summits and torrents as well as calm lakes - as expressions of Divine power. He enjoyed success during his lifetime, partly due to a firm adherence to a conventional landscape painting tradition. A year after Calame s arrival in Paris, the artist exhibited a Vue prise dans la Valle d Ansasca, effet du soir, in the Paris Salon of 1841. That painting was purchased by King Louis-Philippe and according to Calame s memoirs hung in, "...le salon prcdant la Salle du Trône aux Tuileries". That painting, however, now hangs in the Assemble National, Paris. 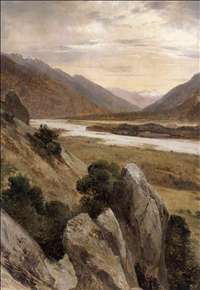 Among his best-known pictures are Storm at Handeck (1839; Geneva, Museum of Art and History), Sunlight on the Upper Alps of the Valais, Opposite the Range of Mont-Rose (1843-44; Neuchtel, Museum of Art and History), Ruins of the Temples of Paestum (1847; Leipzig, Museum der Bildenden Knste) and Lake of the Four Cantons (1855; Riggisberg, Abegg-Stiftung). Calame also left a large number of prints, notably lithographs, and a quantity of drawings (Geneva, Museum of Art and History and elsewhere). 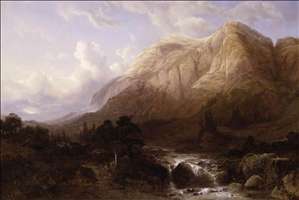 See more details about "Mountainous Landscape with a Torrent"
See more details about "Mountainous Riverscape"